The sportscar manufacturer’s aircraft engines make up a small but extremely interesting chapter in the rich history of Porsche. It is a story which reaches far back in time, as more than 100 years ago Ferdinand Porsche also used aircraft engines to establish the reputation of a diverse engineering company that would later become the company Porsche. In 1955, when the aircraft engine ban in Germany was lifted in line with the Paris Agreements, it was recognised at Porsche that the air-cooled four-cylinder boxer engine of the 356 would also be suitable as the basis for an aircraft engine. And so came about the Porsche 678 aircraft engine with power outputs from 52 to 75hp, which was built right into the 1960s, and powered among other things the prototype of the first German post-war aircraft to be built in significant numbers, the Pützer Elster. 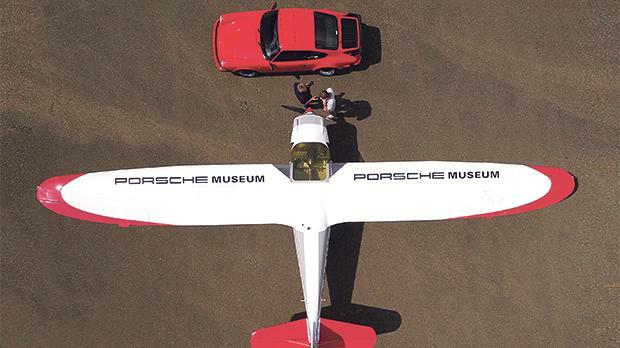 Since September 2010, the Porsche Museum has looked after the company’s tradition not only on land but also in the air, with a carefully restored Pützer Elster B model. Later, Porsche took up the matter of aircraft engines again. Similarly to the development of the Type 678 aircraft engine, in the early 1980s it was the six-cylinder boxer from the 911 that caught people’s attention, and in September 1983 flight testing began for the Porsche aircraft engine PFM 3200. To comply with the redundancies required for aircraft engines, the 204 to 220 hp engine gained a dual ignition and two alternators, and the camshaft drivetrain was converted from chain to spur gears. In times like these when fuel is precious and above all expensive, this is just one good reason to tend to and look after the Porsche engine, and Uwe Sauter from the airport in Heubach is today’s global specialist in this. In the early 1980s, he became involved in the development of this power unit in Weissach, and since leaving the sportscar manufacturer after the production and development of the PFM engine was discontinued in 1991, he has taken care of the remaining 22 of around 80 engines originally built in Europe, Australia and the US.